Remember when everyone started bringing hummus and crackers to potlucks? Or those vegetable platters with ranch dressing? Planning the perfect potluck requires a lot of organizing, but it doesn’t have to be hard work. 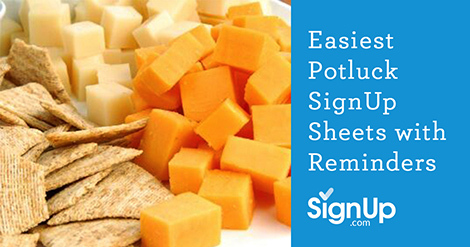 SignUp.com has everything to help organize the details of every kind of potluck or covered dish supper. The key to every successful potluck meal is organization and communication. 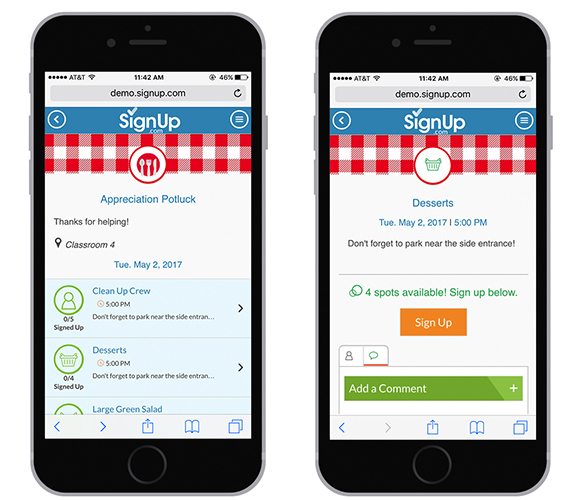 SignUp.com has easy potluck SignUp sheets, event reminders, and checklists to make sure your potluck runs smoothly and without duplication of effort. Participants can sign up with the dish they are contributing, be reminded of their commitment, and prepare for a fun and fabulous potluck meal! Online Potluck SignUp Sheet (Participant View): Participants can sign up directly from their smart phones, choosing what to bring, asking questions of organizers, and trading notes with each other. Automated event reminders help everyone remember the date and time, and any particular details the organizer needs to communicate. • Place plates, cutlery and napkins at the beginning of your line so people won’t forget them. • Don’t forget to print out meal tags that specify what is in each dish—very important for anyone with dietary restrictions or food allergies. • Place drinks and desserts on a separate table which leaves space at the main entree table, and allows guests to set their plates down before picking up these items. • Plan a brief presentation or activity during the meal wrap up that will engage the guests over coffee and dessert. This is a great opportunity to give out informal awards, or acknowledge extraordinary contributions. Don’t forget to acknowledge your potluck organizers and participants! • Double check your potluck SignUp sheet. Did you include the following items? Now that you're all set up, enjoy as your organizational efforts pay off and the perfect potluck meal happens before your eyes!